It's hard to find a scenario where I would be interested in buying shares of Barrick Gold, United States Steel, or Calumet Specialty Products Partners. It's hard for me as an investor to hide my affinity for dividend stocks. The more and more I learn about my own personal investing style, I find that dividend stocks fit my temperament better than anything else: They may not lead to those big-time multibaggers over a couple years, but they tend to maintain steady growth and throw off cash that can be reinvested right back into that stock. Over a multidecade time horizon, that can really pay off. That being said, there are just a small set of dividend stocks I can't get behind. Three companies in particular -- Barrick Gold (NYSE:GOLD), United States Steel (NYSE:X), and Calumet Specialty Product Partners (NASDAQ:CLMT) -- are the embodiment of dividend stocks I would avoid. Gold and other precious metals are in many ways similar to other commodities in the sense that they are cyclical businesses, and investing for the long term in these industries comes down to buying the right stocks at the right time. Based on this logic, investing in gold stocks would have been a decent bet recently as the price of gold has increased 14% so far this year while Barrick Gold in particular has been drastically lowering costs to generate returns and free cash flow. Over the company's long tenure, though, it hasn't had a history of being able to achieve either. ABX return on equity (TTM) data by YCharts. The company has only been able to generate strong levels of free cash flow over the past year or so, where it has drastically cut back on investing in new mines and has even resorted to selling assets. Also, despite carrying larger loads of debt -- something that, in theory, juice returns on equity -- Barrick's returns on equity over the past 20 years have only occasionally been greater than 10%. Perhaps things look better right now for Barrick as it says it's deleveraging and focusing on cash generation. That can only last so long, though, and eventually spending will have to ramp up to replace production at existing mines. Once that happens, don't be surprised if the company finds itself back to tepid cash flow to support its small dividend and marginal returns for investors. Whenever a new technology comes along and disrupts an industry, it seems as though investors overestimate the rate of disruption and how long the tried-and-true parts of the business can hang on. In the case of steelmaking, there has been a long and gradual shift from the older technology that United States Steel uses -- blast furnaces -- to more modern technologies such as direct reduced iron and electric arc furnaces. These two technologies are advantageous because they are less energy intensive -- a major input for steel, they can use cheaper feedstocks like scrap steel, and faster wind down/start-up times mean they can be more flexible to market demand. As a result, companies that have employed these technologies have been able to make steel for lower costs and, in turn, lower margins for U.S. Steel. For close to 30 years, U.S. Steel's major competitor -- Nucor (NYSE:NUE) -- has been able to keep costs lower and put pressure on U.S. Steel's margins. 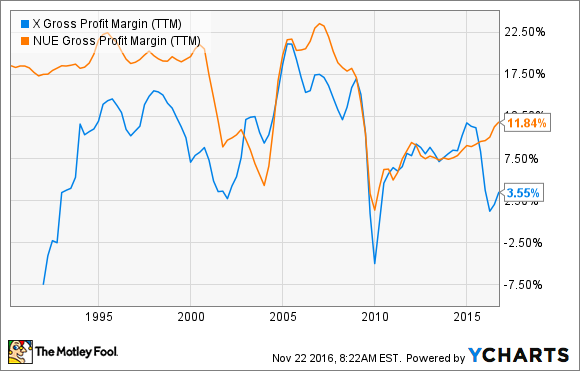 X gross profit margin (TTM) data by YCharts. 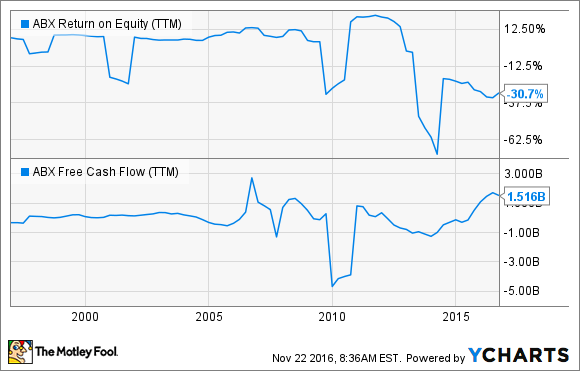 This constant pressure has led the company to produce lackluster returns on equity for decades. 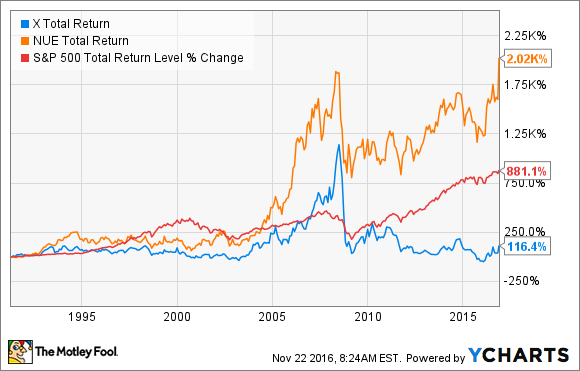 So it's no wonder that over the past couple decades both Nucor and the broader market have left U.S. Steel way behind in terms of total return. X total return price data by YCharts. Perhaps U.S. Steel will be able to make a comeback someday by transitioning to more modern steelmaking techniques and get out from under a relatively large pile of debt, but that has been the case for more than 20 years. So I'm not holding by breath or buying this dividend stock in hopes of better times ahead. Even though Calumet has suspended its payout to investors this year, this company is the epitome of a business that is structured as an income-oriented master limited partnership but probably shouldn't be. One of the things that makes an MLP an effective investment vehicle is a steady cash flow that doesn't have a lot of commodity risk despite being in commodities. As a refiner of both specialty petroleum products and fuel, Calumet has a lot of direct exposure to commodity prices and can see its margins expand and contract wildly depend on where we are in the cycle. There are some other MLPs on the refining side of oil and gas business, but they don't kid themselves with the ability to pay a consistent dividend. Rather, they pay a variable rate dividend that is based on the amount of cash that comes in the door during any given quarter such that it isn't paying out more than what it brings in. To make matters worse, Calumet is one of those MLPs that tried to grow incredibly fast and fueled that growth with debt. When some of those investments didn't pan out as expected, it left the company with a mountain of debt that it has little hope of getting out of for a very, very long time. Calumet is a glaring example of why many investors avoid master limited partnerships, which is a shame because there are a small handful that are very well-run businesses that have reliably paid growing distributions to their investors. There are great dividend stocks across a wide variety of industries, even in the ones that Barrick, U.S. Steel, and Calumet are in. That being said, these companies are simply dividend stocks that I will never touch, and investors with very long investment time horizons should probably avoid them as well.